On this day in 742 Charlemagne was born. King of the Franks, Charles (d. 814) had a bunch of cool titles (Carolus Magnus!) and he expanded his kingdom and did all that kind of kingly stuff, including moving around some borders that are still there (Pope John Paul II called him the “father of Europe”); but he also did some great stuff for architecture. So much so, that he gets a period/style named after him, the Carolingian Renaissance, which is sort of a happy cultured bump in the road between the Fall of Rome and the advent of Gothic. He lit a wee light in northern Europe’s so-called Dark Ages. Like any renaissance, his was intentional. 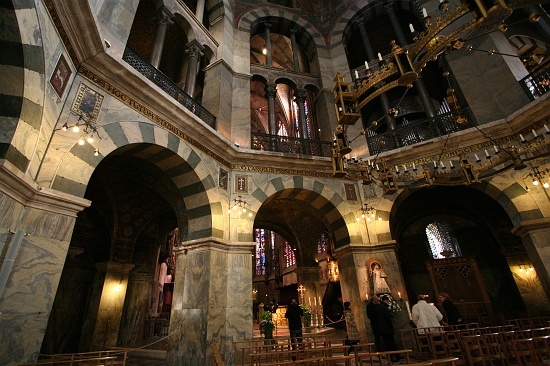 Charlemagne gathered a collection of very smart people around him at his court in Aachen, where he encouraged their work in literature, art, architecture and scriptural studies, in an effort to live up to models of past, glorious empires. Although the buildings resulting from his efforts are long-lasting, their small number is indicative of the small reach of Charlemagne’s efforts. Nonetheless, his directions did lead to a distinct kind of architecture that drew from generally “Roman” precedents, including not just the capital of the ancient Empire but Byzantine and Early Christian influence as well–grabbing especially at those later straws as evince of greatness that also gleamed with the proper faith. There’s something to names, and Charles the Great lived up to his. He was a fine uptick in Frankish might after his father, the unfortunately-monikered Pepin the Short, although his grandfather, Charles Martel (“the hammer”) had the best name. Charlemagne’s heir was known as Louis the Pious or, worse yet, Louis the Debonaire–you can tell by the nickname that this guy was just not up to the task of picking up where his dad left off. A generation after Charlemagne’s death his empire was in disarray, with nary a vault or mosaic or much of anything going on in most of Europe for more than a century to come. Thank goodness for al-Andalus. I love the image of an 11 year-old Mies, in shorts, chomping on a cigar! You are currently reading April 02: a twinkle in the Dark Ages at Clio’s Calendar: Daily Musings on Architectural History.